Life with two young boys means constantly cleaning up messes! From dirty fingerprints on the walls and sticky residue on toys to food stuck to the furniture and dirt on the floors. Plus, the laundry I have to do on a daily basis is incredible! But I don’t really mind all the cleaning, because I know they’re having fun and creating their own memories in our home. Last year I was fortunate enough to be able to review some great cleaning products to help with their messes from dapple. Not only was I impressed with the way the products worked, I was equally as impressed with their commitment to keeping cleaning products safe and natural. 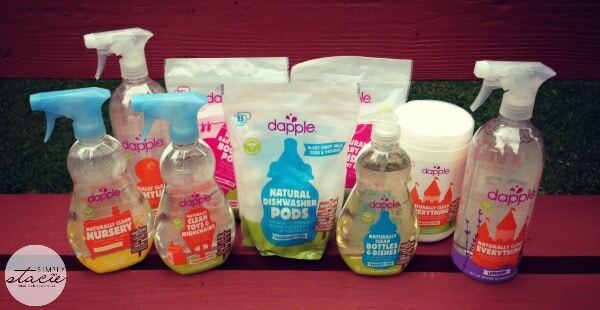 I received a variety of products from dapple for this review, including seven new products in their line. They’ve rebranded their products to make them easy to identify, and have made them as cute on the outside as they are effective on the inside! * Laundry Pods ($9.99) – I’m a huge fan of laundry pods. Their easy to store and easy to use. These pods are hypoallergenic and fragrance free and also free of brighteners and softeners. These pods are formulated for the gentle skin of newborns and toddlers and are great for kids of all ages with eczema (which both of my boys have, so I’m happy to have these on top of my washer). * Laundry Booster Pods ($9.99) – These work in conjunction with your detergent to tackle larger loads and stubborn stains. These are also fragrance free and have been doing a great job on both of my boys clothes (even after marathon sessions outside!). * Naturally Clean Everything Spray ($6.99) – This is truly an all-purpose spray – you can use it on countertops, toys, high chairs, etc. It’s free from parabens, phthalates, dyes, and other harmful chemicals, so you can feel good about using it anywhere and everywhere in your home. * Naturally Clean Nursery Spray ($5.99) – I love the light fresh scent of this spray. I’ve passed this on to my brother who has a baby in diapers still, as this is a great quick way to wipe down and clean changing tables among other nursery items. 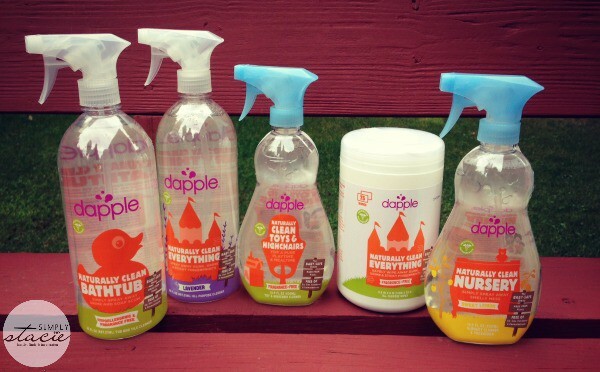 * Naturally Clean Toys & Highchairs ($5.99) – A must-have for every home with toys! It’s gentle and pure formula is made to help you give toys a quick clean before they’re put back in to little mouths. It’s a great spray to have on hand, especially after play dates or when toys are coming back from a day at school or time outside. * Naturally Clean Bathtub ($6.99) – This is my new favorite bath cleaner. It’s specially formulated to keep tubs residue-free while being gentle on your kids skin. With the sensitive skin my boys have, I’m always happy to find a cleaning product that really cleans AND is gentle enough for their skin so I don’t have to worry about rashes or other breakouts. * Natural Dishwasher Pods ($8.99) – When my youngest was born we discovered he had a severe milk protein allergy. He was only able to ingest a special prescription formula that always left an awful residue that took two rounds in the dishwasher to get rid of! 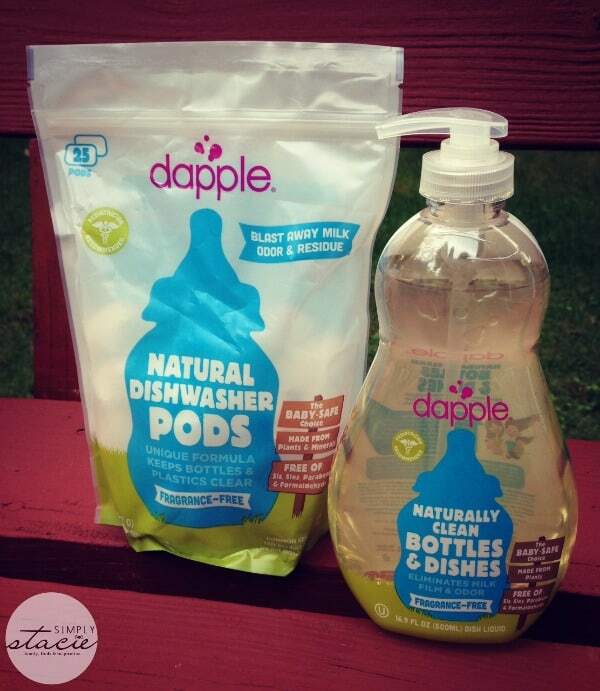 Now dapple has come up with a dishwasher pod product that works not only on your everyday dishes and silverware, but also on that horrible milk-residue and odor buildup on baby bottles. * Naturally Clean Bottles & Dishes ($5.99) – Made with all-natural ingredients, this dish soap safely cleans baby bottles, sippy cups, pacifiers and breast pump components. It’s made with award-winning green technology that targets milk residue and uses baking soda to combat odor. This is also great for using on all of your hand-wash items, and I like that it’s not drying on my skin. * Naturally Clean Everything Wipes ($7.19) – Sometimes a quick wipe is all you need to clean up a small mess or wipe down a toy or two. These wipes work in the same way the spray does. I keep these under my kitchen sink for quick clean-ups. I’m quite impressed with everything dapple has to offer, and love that they really put thought and care into their products. These are safe to use around kids and pets, and I feel good using them in my home. 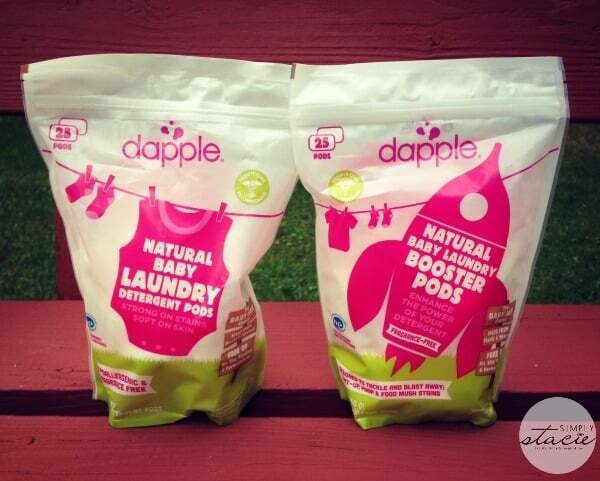 The dapple line of products was created by moms, for moms to help combat the unique messes of families with young children. All dapple products are biodegradable and free of any harmful or potentially harmful ingredients, including synthetic dyes or fragrances, SLES, SLS, parabens, 1,4-dioxane and phthalates. To learn more about dapple, visit their website. You can also find them on Twitter, Facebook, Instagram, and Pinterest. I’d like to try the stain remover spray. I like their All-Purpose Cleaner Wipes! After visiting the site, I decided I would really like to try the Dishwasher Pods.